I purchased this vanity for our guest bathroom. I actually think it looks better in real life than pictures. Very nice quality, although the 4inch backsplash did arrive cracked, but Overstock CustomerService quickly compensated for us. I was surprised there was any damage because the vanity was packaged extremely well. We have received quite a few compliments on the look of the vanity. 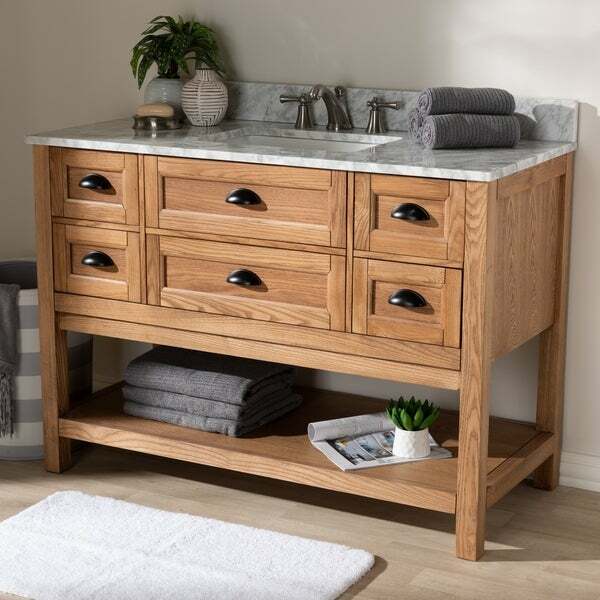 The Alamitos bathroom vanity is designed to flaunt the beauty of its wood, inviting you to bring a touch of texture to your bathroom. The earth-bound look derives its appeal from clean lines and tactile weathered oak veneer. Firmly built from solid wood and plywood, the Alamitos comes with a Carrara marble countertop and backsplash that showcase white with gray veining. Dimensions 22.0 In. X 48.0 In. X 34.65 In.